Nikolai Gogol places a bet. After dinner Nozdrev and Chichikov repaired to the parlor, where, after candles had been brought, Chichikov perceived that his host had produced a pack of cards. The human working stock is of interest only insofar as it is profitable. “What am I to say to the fellow?” thought Chichikov. He reflected for a moment and then explained that he wanted the dead souls in order to acquire a better standing in society, since at present he possessed little landed property and only a handful of serfs. Chichikov himself perceived that his device had been a clumsy one, and his pretext weak. “I must tell him straight-out,” he said to himself as he pulled his wits together. 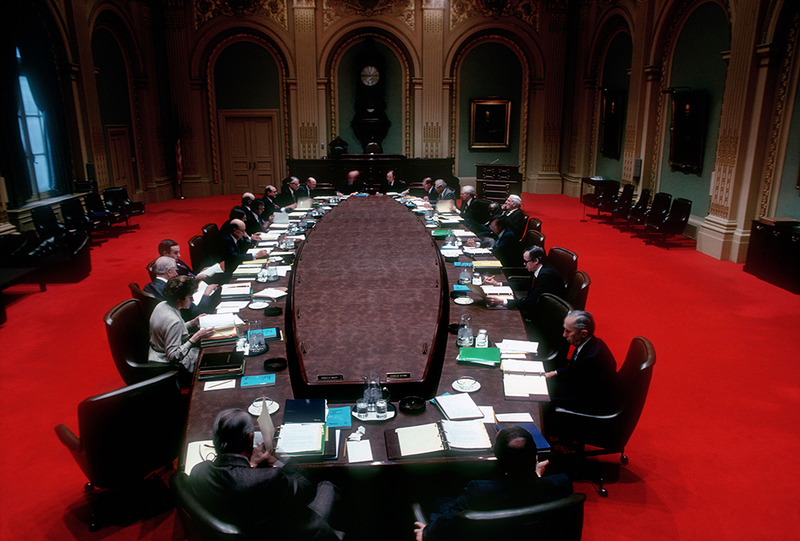 Monthly meeting of the board of the New York Stock Exchange, 1979. Photograph by Burt Glinn. © Burt Glinn / Magnum Photos. “Again you are lying,” said Nozdrev. “Then look here, I have been lying only to this extent.” And Chichikov marked off on his little finger a minute portion. This remark hurt Chichikov, for at any time he disliked expressions gross or offensive to decency, and never allowed anyone to behave toward him with an undue measure of familiarity. Consequently, his sense of umbrage on the present occasion was unbounded. “But what should I want with your colt?” said Chichikov, genuinely astonished at the proposal. 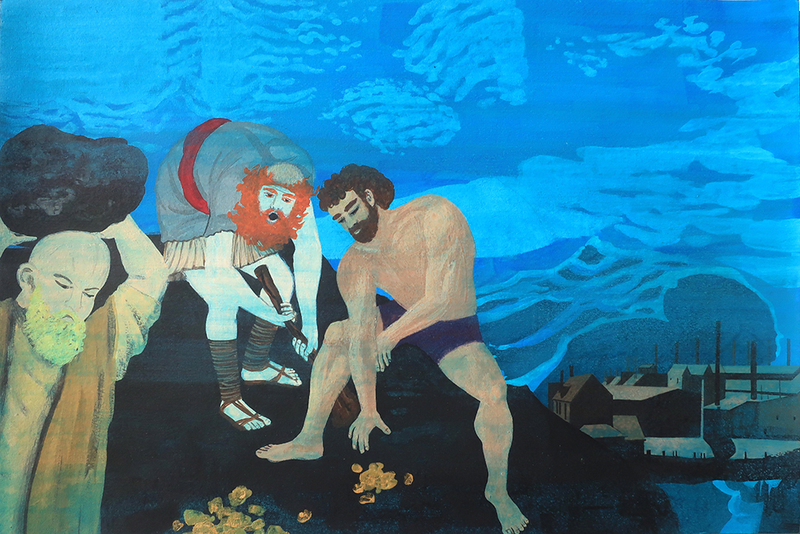 Power, Money, by Jennifer Muskopf, 2012. Gouache and marker on 140 pound, 50 percent cotton paper, 12 x 18 inches. © Jennifer Muskopf, courtesy the artist. Chichikov duly thanked his interlocutor but continued to decline either the gray horse or the roan mare. And seizing Chichikov by the hand, Nozdrev drew him toward the other room, where in spite of the fact that Chichikov, with his feet planted firmly on the floor, assured his host again and again that he knew exactly what the organ was like, he was forced once more to hear how Marlborough went to the war. “The ramping, incorrigible devil!” thought Chichikov to himself, as at all hazards he resolved to escape from britskas, organs, and every species of dog, however marvelously barrel ribbed and tucked up of paw. “And in exchange, you shall have the britska, the barrel organ, and the dead souls,” repeated Nozdrev. “I must decline the offer,” said Chichikov. The merchant always has fresh losses to expect, and the dread of base poverty forbids his rest. “No. To leave an issue to cards means to submit oneself to the unknown,” said Chichikov, covertly glancing at the pack that Nozdrev had got in his hands. Somehow the way in which his companion had cut that pack seemed to him suspicious. Just as Nozdrev uttered the words, his servant Porphyri entered with a fresh bottle of liquor, but Chichikov declined either to play or to drink. “Why do you refuse to play?” asked Nozdrev. From Dead Souls. Born in 1809 to a Polish Ukrainian landowning family, Gogol moved to St. Petersburg as a young man to pursue a civil service career. He wrote to his mother in 1829 to ask for detailed descriptions of Ukrainian folk customs and costumes, which he used as material for Evenings on a Farm Near Dikanka, a collection of stories that earned him instant fame. Elsewhere in this satirical novel, it is theorized that Chichikov is “Napoleon in disguise”—that the Frenchman had been released from St. Helena to wreak havoc on Russia.